Pueblo Partisans is a�registered society, with certification in British Columbia, and is�composed of service professionals and volunteers, whose primary goal is to promote community response to shared human aspirations while considering the specific relationships of communities to a larger society. More details are found in our Constitution. 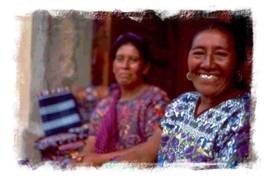 Our projects, mostly centered in the indigenous rural community of Tanhoc, Guatemala (map PDF),�train local community members to design, implement and evaluate programs that address food production, nutrition, health, education, income generation, human rights and retention of cultural identity. We thank each one of our donors for their generous support. In choosing the two words in our name PUEBLO PARTISANS, we give expression to our beliefs. We believe, in the first instance, that we have an obligation to make conscious and explicit our beliefs. Relationships between communities and Publo Partisans, in our view, are conditional on the distinctive experiences and value systems of the parties involved. Where experiences and value systems are articulated, informed contractual relationships between communities and PUEBLO PARTISANS can be achieved. PUEBLO PARTISANS' logo is a depiction of a Pueblo Indian settlement as an example of harmony between "people and place". Our other word, PARTISANS, means to us, a group of people who make no claims of neutrality or objectivity, rather the group actively champions an idealistic point of view. PARTISANS have a collective stake in the outcome of their activities; they do not view themselves as helpers. PARTISANS work in solidarity with one another and frequently with those who are unable to participate actively. PUEBLO PARTISANS believes that we live increasingly in a world in which most people are struggling not only for their physical survival but the survival of their identity. We do not see solutions to be those of streamlining mega-systems. Instead, we believe in facilitating culturally relevant local responses that factor in global trends.� Technologies in the form of knowledge and tools cannot be transferred across time and space. Imported technology must be mindfully selected and adapted by its users.